The Senate GOP’s campaign manager for the 2018 campaign is pushing a new amnesty bill that would aid millions of illegals — even though polls show 2018 voters overwhelmingly prefer immigration policies which aid Americans. Colorado Sen. Cory Gardner’s pro-amnesty bill “is a real conflict of interest … [because] it damages the White House and the [GOP] Senate,” said one source. The Gardner bill was criticized by the Department of Homeland Security. Gardner-Bennett bill, AKA the Schumer bill, violates the framework, would legalize unlimited numbers through chain migration, and leave deadly loopholes intact. Gardner is pushing his amnesty even though President Donald Trump and the GOP leadership are backing an amnesty-and-reform bill by Sen. Chuck Grassley which includes several popular proposals to curb illegal immigration, chain migration, and the visa lottery. Gardner is the chairman of the National Republican Senatorial Committee which provides GOP Senate candidates with money and messaging to win their 2018 races. In November, the GOP has a good chance to win several of ten seats now held by Democratic Senators in states won by Trump in 2016. Many of the 2018 voters in those states voted for Trump in 2016 because of his immigration policies, yet GOP candidates in 2018 may not be able to highlight Democrats’ pro-amnesty policies because of Gardner’s NRSC control over funding and the campaign messages. Gardner’s reluctance to press the GOP advantage on immigration is visible at the NRSC site, which downplays the role of immigration — and buries the Democrats’ apparent favoritism for migrants over Americans. 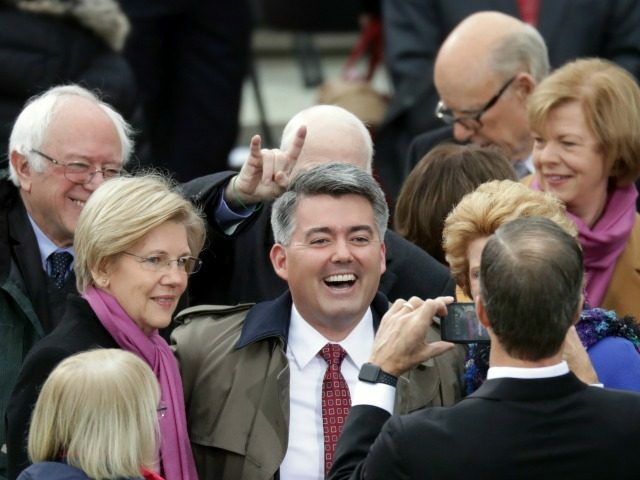 Gardner’s February 14 proposal was drafted with Democratic Sen. Michael Bennet, who was a charter member of the 2013 “Gang of Eight” group of pro-amnesty Senators. The joint proposal would provide an amnesty for at least 2 million illegals — but would not reform chain-migration rules to prevent those illegals from later getting citizenship for more of their relatives, including their elderly, non-working parents. The Gardner proposal would authorize $25 billion for a wall, but the promised money could be used for other purposes. Moreover, the proposal would not include legal reforms sought by Trump to ensure that migrants cannot use existing legal loopholes to bypass the concrete-and-rebar wall. Those loopholes have allowed hundreds of thousands of Central American migrants to move easily through the border fences since 2011. Gardner’s staff did not respond to questions from Breitbart News. The Senator’s push for amnesty makes him a puppet of the Democrats’ Senate leader, Sen. Chuck Schumer, said Mark Krikorian, the director of the Center for Immigration Studies. So @DHSgov spotxis saying that the Head of the NRSC(Republican Senator Cory Gardner) is a puppet of Democratic Leader @SenSchumer? Immigration polls which ask people to pick a priority or to decide which options are fair show that voters in the polling booth put a high priority on helping their families and fellow nationals get decent jobs in a high-tech, high-immigration, low-wage economy. Those results are very different from the “Nation of Immigrants” polls which are funded by CEOs and progressives, and which pressure Americans to say they welcome migrants. 60% of voters believe that children who were brought into this country illegally by their parents, many of whom are now in their 20s and 30s, should not be given preference for their parents or relatives to move to this country. 79% of voters think priority for those coming to the United States should be based on ability to contribute to America, as measured by education and skills—and not based on having relatives in the country. This includes 85% of African-American voters and 72% of Democrats and Clinton voters. 68% of voters oppose the visa lottery, which randomly picks 50,000 applicants from countries with low numbers of immigrants in the previous five years to enter the United States each year. This includes 62% of Democratic voters, 61% of Hispanic voters, and 57% of African-American voters. Four million Americans turn 18 each year and begin looking for good jobs in the free market, as federal immigration policy invites 1 million new immigrants.